Endocrine: Adrenals-breaks down protein and lipids to produce glucose. Reduce inflammation and immune response. Controls the 'fight or flight' response to stress. Pancreas-(Alpha cells) produces glucagon responsible for raising blood glucose levels and triggers muscle and liver cells to break down glycogen to release glucose in the blood stream. (Beta cells) produces insulin responsible for lowering blood glucose levels after a meal. This triggers the absorption of glucose from the blood to the cells where it is stored. Balanced/Open Chakra: When your solar plexus chakra is balance, you feel confident and powerful and have high self-esteem. You value yourself and your works and you feel as if you have purpose in everything you do. You carry strength and power in the ability to move forward and make conscious decisions in doing so. You are in complete control of your emotions and actions and the ego does not influence your actions. You have clear goal, intentions, and desires and are self-motivated. You naturally express yourself in a powerful way with the freedom to choose and direct your life. You have a good perception of who you are. You accept your place in the universe and accept and appreciate the positions people have in your life and acknowledge their uniqueness. You radiate with life energy. Underactive: If your solar plexus chakra is underactive you may be very passive and indecisive. You doubt yourself and your decisions, usually ruled by being less confident, or worried about what others will think of you. You often feel as though you are not good enough and seek constant approval from others. You tend to mistrust people or put your trust in the wrong people. You develop co-dependent relationships. You are often afraid to be alone. You are afraid to face or analyze thoughts or feelings and avoid feelings of depression and anxiety. Overactive: If your solar plexus chakra is overactive you tend to be domineering. You are harsh, judgmental, and critical towards others and yourself. You are very rigid in your thinking and tend to easily find fault in things and people. You have a stubborn attitude, your way or no way, and may always think you are right. You may find yourself making plans but not fulfilling them. You tend to be a workaholic and work is the main priority. You are constantly working at perfecting things for feeling that nothing is ever good enough as it is. Physical symptoms: Diabetes, digestive issues, adrenal organ illness, hypoglycemia, hyperglycemia, poor digestion, weight problems, ulcers, arthritis, issues with pancreas, liver and/or kidneys, hepatitis, colon cancer. The Solar Plexus Chakra houses our will-power, the warrior within. It is the seat of fire, passion and desire, and the will to live. 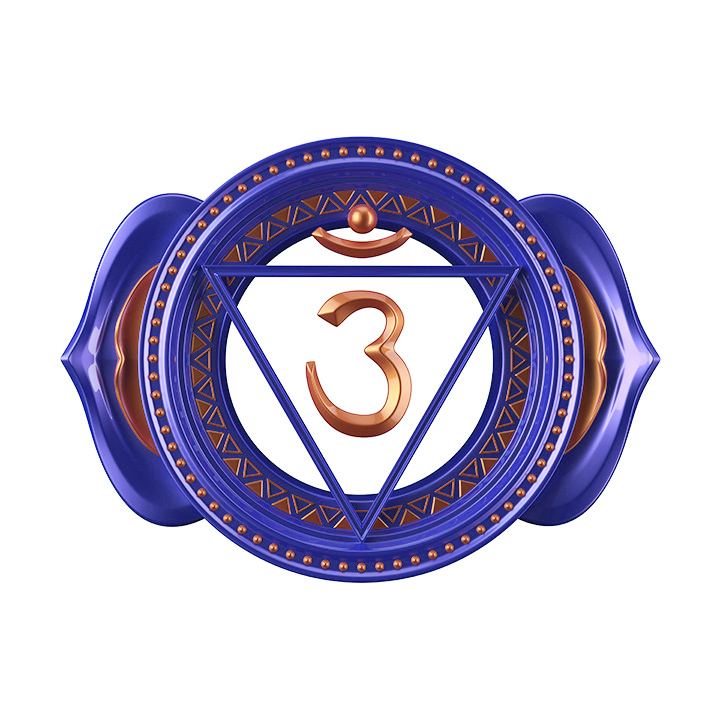 This chakra enables us to empower ourselves which helps us to open new doors in our life. When balanced there is no need to control another's will and neither are you wanting or needing to be controlled. It also helps us to overcome fears that control our lives. It teaches us how to balance the ego, self-confidence, and have self-control. In addition, the message this chakra carries is that you have the POWER to choose. The power of choice is one of the greatest gifts in life. You can choose if you want to take charge and direction in your life. You can choose to live out your karma or actively make a decision to change it. You can choose healing. You can choose in this very moment if you want to smile or frown. Any time you judge or criticize yourself, you deplete this chakra and weaken your willpower. Loving yourself and knowing your value and your worth, that you are unique and one of a kind, are ways to build your solar plexus chakra. Know that you can express yourself in a powerful way and that you have the freedom to choose to be yourself and direct your own life. Stand firm in your own personal power. 1. Visualize the Solar Plexus chakra symbol and a bright yellow ball of light above the navel and below the rib cage where the solar plexus chakra is positioned. 2. Sit and bask in sunlight. 4. Light a yellow candle to use during visualization or meditation. Concentrate on watching the movement and dance of the fire, imagining yourself being that light. 5. Stimulate your mind by playing mind puzzles, take a class in a field you enjoy doing, and by reading books. Completing or accomplishing these tasks builds strength and self-confidence. 6. Practice letting go of the ego and titles, and experience things as they are and as they come without the need to control it. 7. Use aromatherapy with essential oils that have a citrus or spicy scent. CONFIDENCE Solar Plexus Chakra crystal infused oil is formulated to facilitate balance. 10. Wear or surround yourself in the color yellow. 11. Eat solar plexus balancing foods such as bananas, granola, grains, bread, flax seed, sunflower seeds and organic dairy such as cheese and yogurt. You can also incorporate certain herbs and spices such as ginger, turmeric, cumin, fennel, mint, and chamomile. 12. Practice solar plexus chakra yoga positions. 13. Repeat sacral chakra affirmations. Press play and enjoy 15 minutes of pure tone frequency. Place crystals nearby to be cleared and balanced.